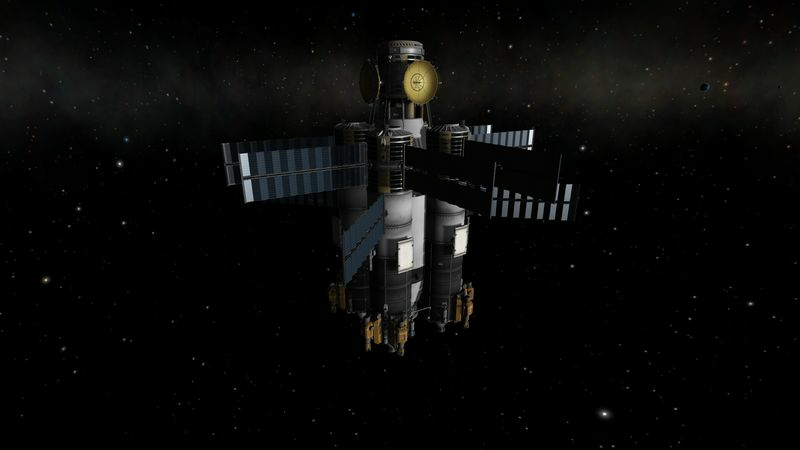 With the Kerbin SOI fueling system fully operational, now using upgraded Ore Miner, a new step in the space program has to be taken. 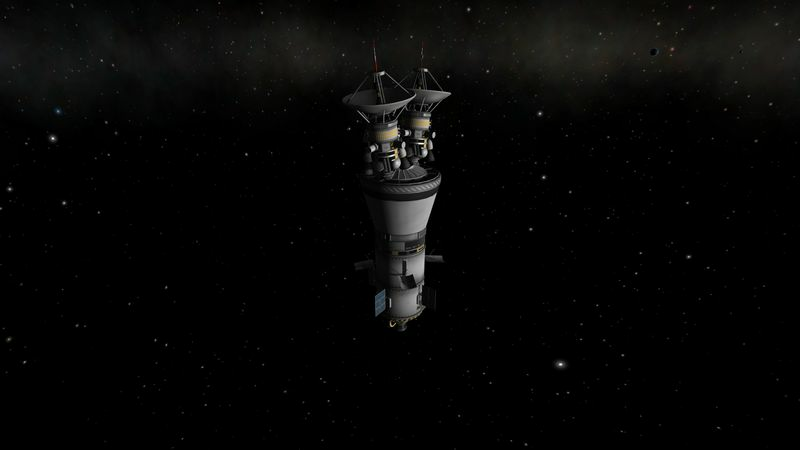 With probes having reached Moho, Eve and Duna, and others en route to Dres, Jool and Eeloo, the nexst step was to send the Kerbals on one of the place already reached by the probes. Obviously the target was Duna. However, the goal is not to send a single mission, but to expand the infrastructure of the space program. 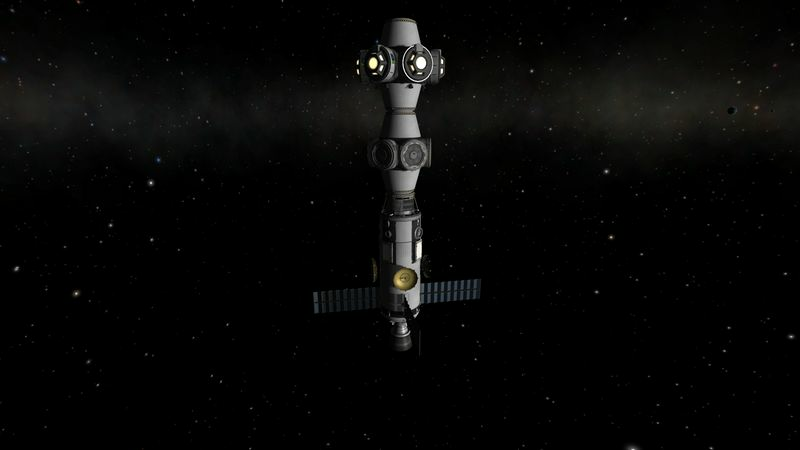 Have a space station and fuel depot un low Duna orbit, similar to the one in Minmus or Kerbin orbit. Have a mining and refueling operation ongoing in Duna SOI. To this end, an armada of 14 ships is being sent to Duna during this transfer window (around Year 3, Day 300). 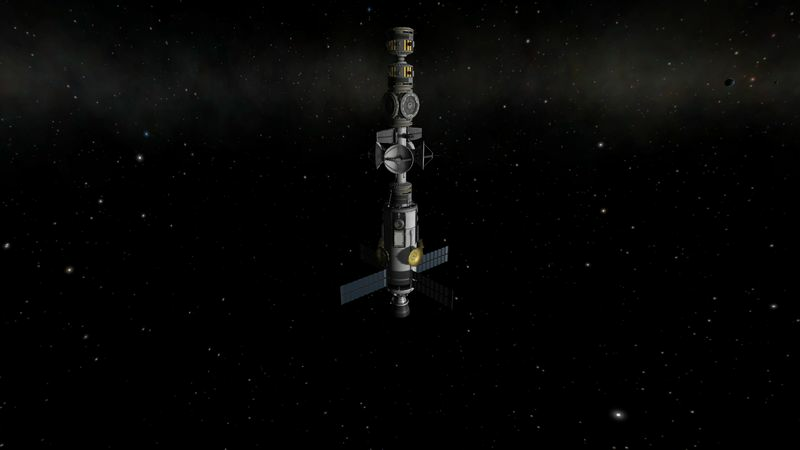 Half of these vessels are for the space station to be assembled in low Duna orbit, the rest are for the other objectives or utilitirians. Going to Duna is a long trip, so the crew members need some space to chill out and not be on each-other nerves. This vehicle with it’s 4 Hitchiker could host 16 Kerbals, but is limited to 12. 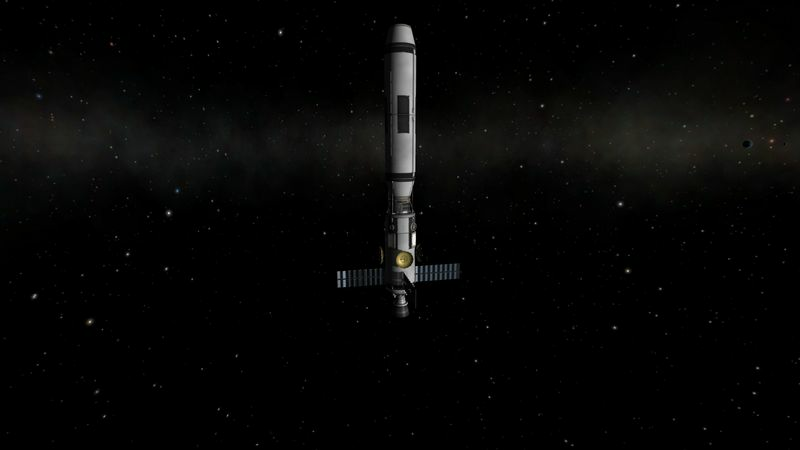 Being the first non-robotic mission to Duna, the crew is limited to two teams (2x3 kerbals). This crew will have a busy schedule, looking over the space station assembly, doing the firsts landings on Duna and Ike and getting the fuel depot fully fueled. The vehicle will of course be re-used by futur Duna bound missions. The top one, with a crew capacity of 3 kerbals, is fitted with science experiments and parachutes, so it can operate on Duna and Ike. There is not enough Δv for a powered landing on Duna, so the crew will have to repack the chutes after landing. The bottom one, is a vacuum shuttle, so wil be used mainly for Ike. 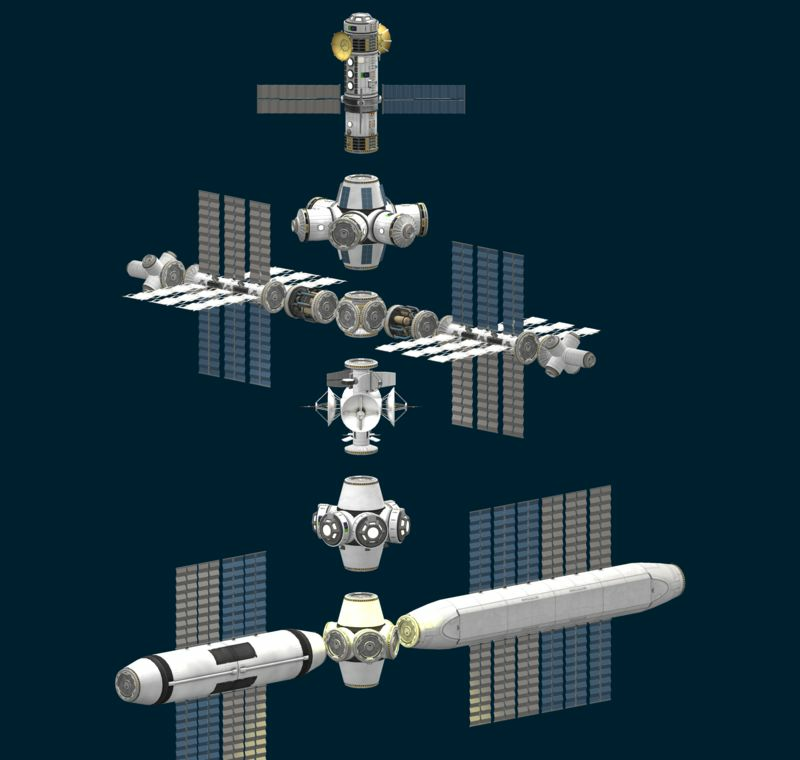 There is no science experiments on board, but the crew capacity is more than doubled compared to the over one (7 kerbals). 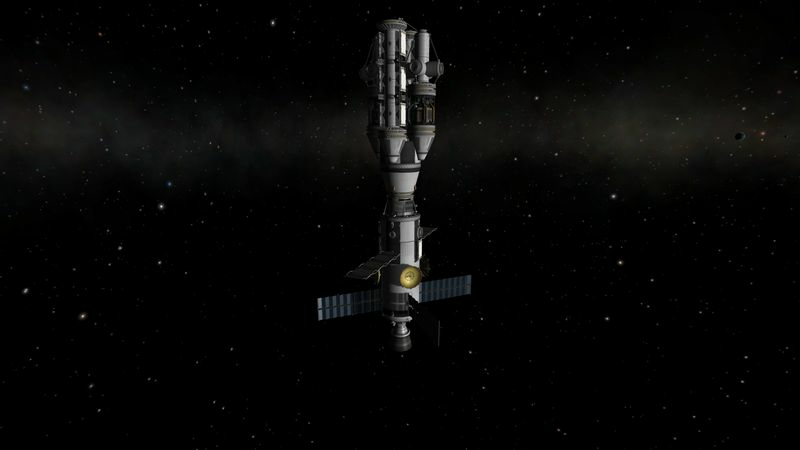 Two of those probes are sent, one is bound for Duna, the other for Ike. These are just small satellites with the two available orbital ore scanner available and some science experiments. 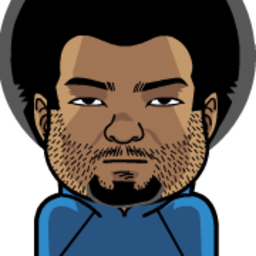 They will each be put in a polar orbit around the target body. There a 12 small landers to check for Duna target landing sites and spots for a ground base later on. 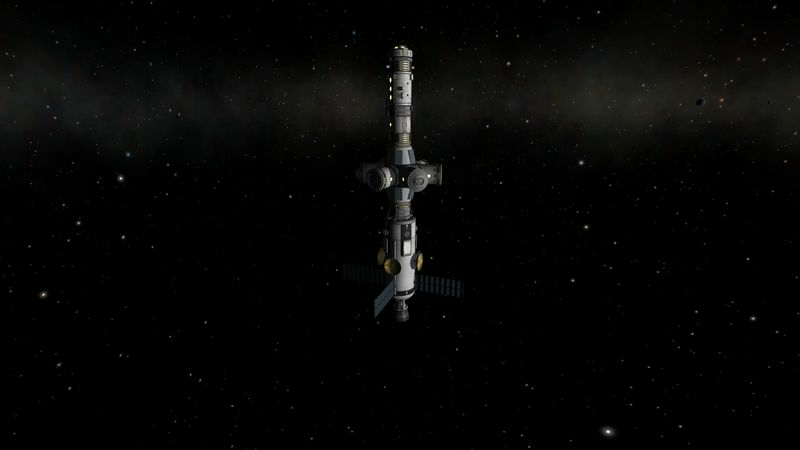 Using the same modules used in the Kerbin SOI space stations, this one will be Duna main space station and fuel depot. 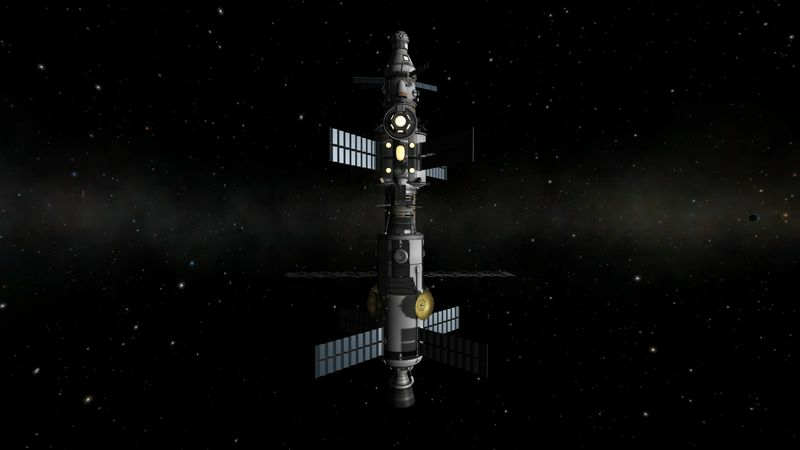 Top of the station is mainly use for Kerbals accommodation. 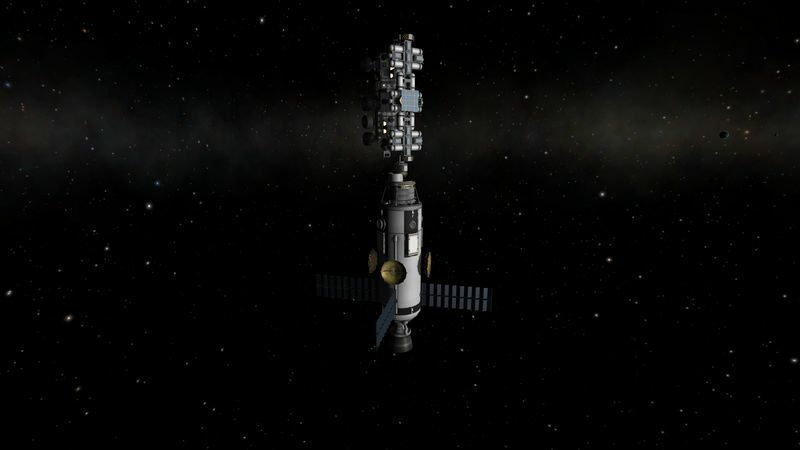 Below are the modules as they are being shipped to Duna. This vessel is one of the most important one of the armada. 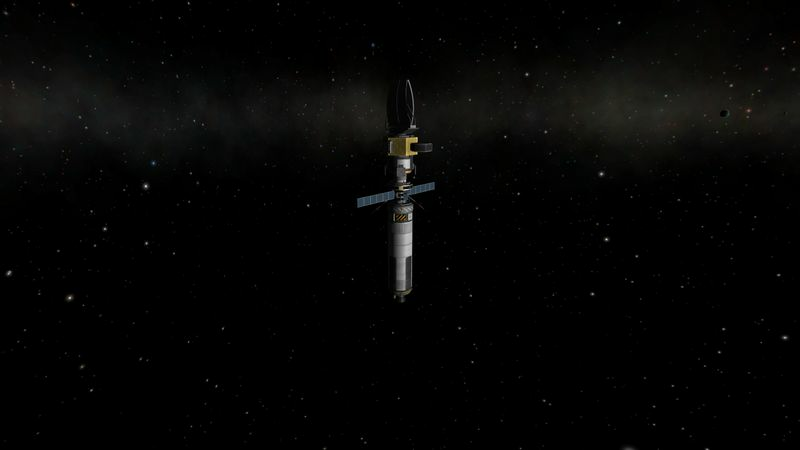 Learning from the second version of ore miner as described Kerbin SOI fueling setup, and after a third version not fully satisfying this vessel is the fourth version of the ore miner, and will in the Duna SOI also fulfill the role of ore tanker. 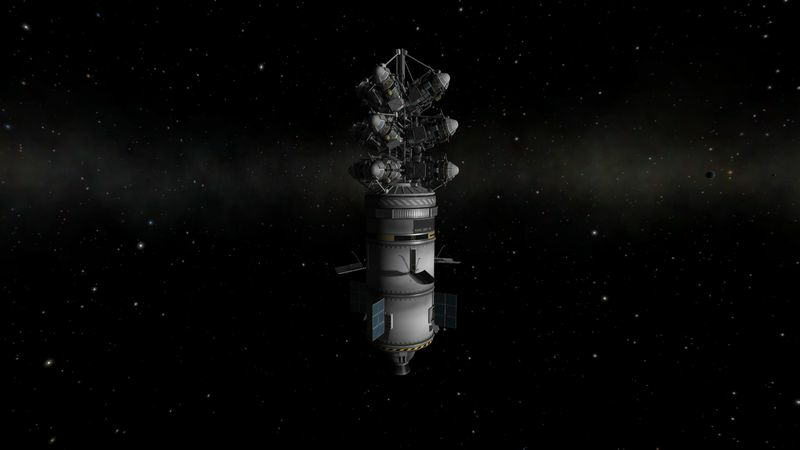 The vessel will mine 18000 units of ore from Ike and bring them to DuSS 01. The vessel as an on-board ISRU to refuel while mining, removing the need to tap into the space station fuel depot to operate. 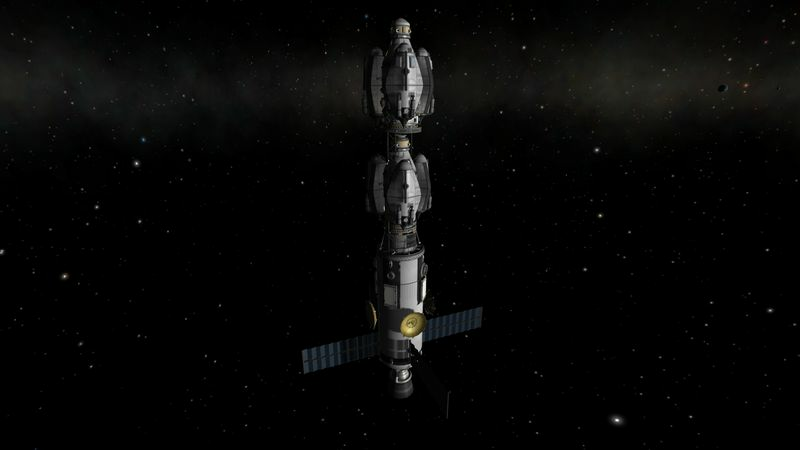 The vessel also include a cabin for 2 kerbals, meaning at least on engineer can embark to improve the mining efficiency. With no ore on board and full fuel tanks, the vessel has ~3800 m/s of Δv, meaning it will bring itself to Duna without using a transfer vehicle. Fully loaded with ore, there is (hopefully) enough Δv to go from Ike ground to Duna space station and back to Ike ground on internal fuel. A landing of this vehicle close to one of the Duna landing site will be attempted. 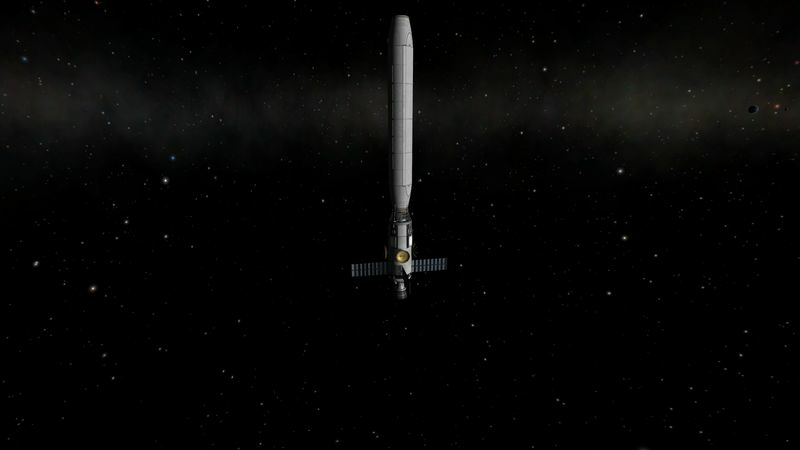 Communications relay satellites to finish the relay network around Duna. 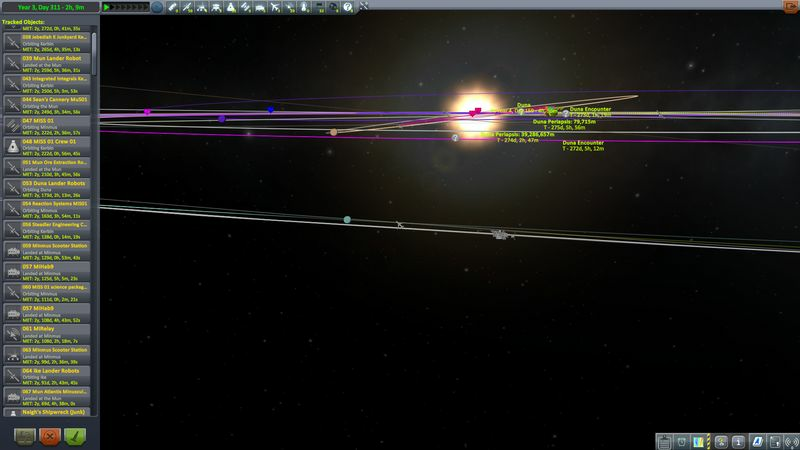 Everybody, except the crew en route to Duna, just after their burns from low Kerbin orbit. 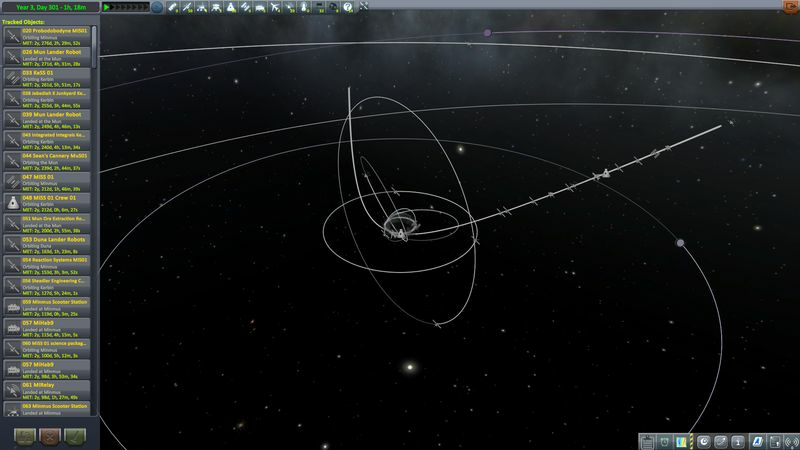 All these vessels where in a 80.5km circular orbit around Kerbin. As far as possible, all of them have been given the same Δv burns (~1070.3 m/s), and the same ejection angle.